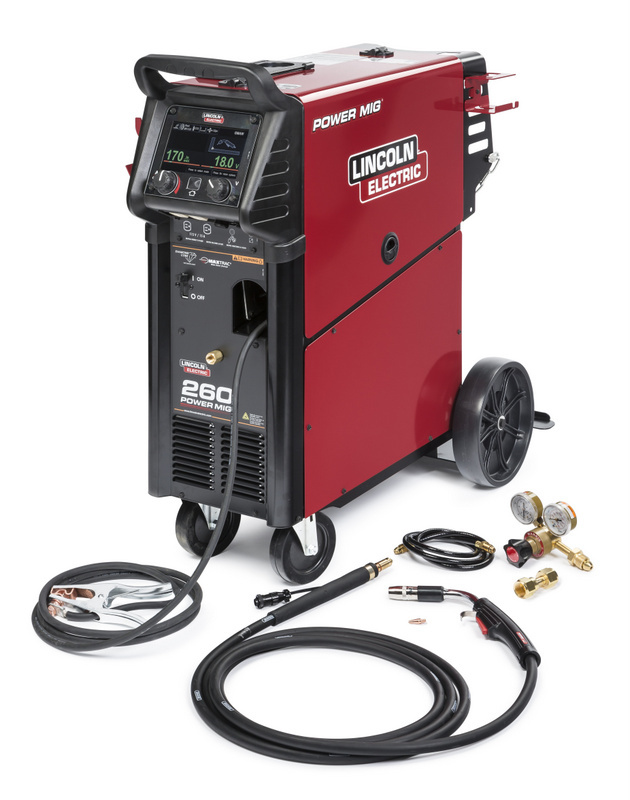 Lincoln Electric recently introduced the latest innovation in welding machinery — the POWER MIG 260. Offering superior welding performance and a multitude of professional features, this product sets the standard for MIG and Flux-Cored welding in light industrial shop fabrication, maintenance and repair work. Designed with the welder in mind, the ergonomic POWER MIG 260 simplifies and streamlines the welding process. Lincoln Electric’s patented ArcFX technology provides instant graphical feedback on the user interface, illustrating how Wire Feed Speed and Voltage affect the weld outcome. The memory capability enables users to load and save weld settings, while its adjustable features allow for a customized welding session. Setup for this machine is quick and easy with the Ready.Set.Weld feature. The push-and-turn digital controls and seven-inch, full color display guides users through the process to make setup and operation intuitive and simple. The unit comes complete with a Maxtrac Wire Drive, Magnum PRO 250L Welding Gun, quick storage accessories, 10-foot work cable with clamp, gas regulator and 10-foot power cable with plug. Additional features include a coil claw for an organized work station, a side mounted tool holder, an angled gun connection for improved feedability. The unit also offers an easily accessible front mounted 115V power outlet along with gun connections. For more info on Lincoln Electric, click this link. Hard! Lincoln Electric is an impressive brand for so many welders without any doubts!